RSS is an easy way to be notified of the latest news and updates from the site. Currently, RSS feeds are supported by most browsers except Google Chrome (although an extension is available). You can also use other services such as Feedly to subscribe to RSS feeds. Most browsers will automatically give you options for subscribing when you click on the RSS icon. The RSS icon can be found on the upper right hand corner of the screen. If you are navigating the site in English, the RSS feed from bilaterals.org will retrieve all articles in all languages. 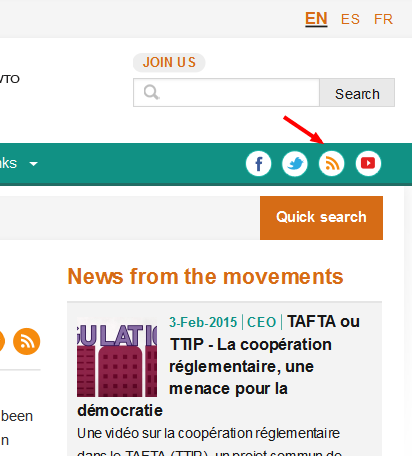 To retrieve articles only in Spanish or French, change the site language first (upper right hand corner of page). Tailoured RSS feeds are also available for specific sections (e.g. 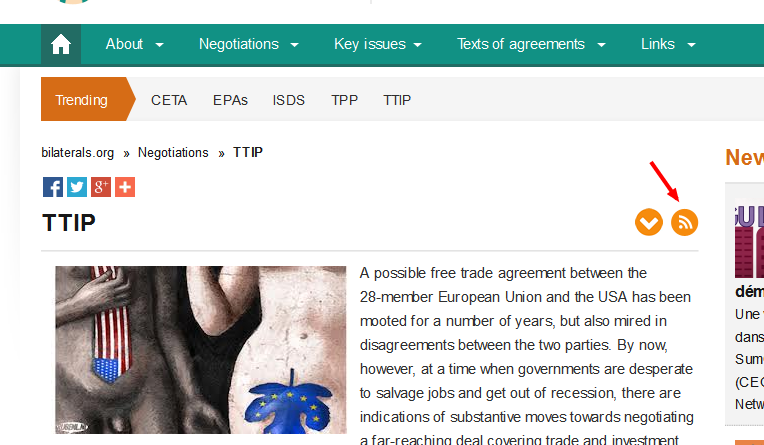 “TTIP” or “China-ASEAN”) or keywords (e.g. “investor-state disputes” or “agriculture”) to the right of the title. Please see below.